The 2018 Buick LaCrosse Avenir will be the second vehicle in the Buick lineup to offer the Avenir trim, after the Enclave, which Buick announced would carry the Avenir trim earlier this year. Originally described as a new luxury sub-brand for Buick, the Avenir name has transformed into a luxury trim that will slowly be rolled out across the Buick lineup. The LaCrosse Avenir has the same shape and largely the same styling as lower LaCrosse trim levels, but its Avenir-exclusive upper and lower front grilles set it apart, as well as standard 19-inch wheels or available 20-inch wheels and Avenir badging. Inside, the Avenir offers brown or black leather seating, standard Navigation, a panoramic moonroof, and more. All-wheel drive is available, as are driver assist features, and variable dampers for a softer ride. These features are in addition to all the features that come on lower trims of the LaCrosse, like convenient wireless charging, heated front seats, Quiet Tuning™, and more. The 2018 Buick LaCrosse Avenir will be available early next year. Pricing has not yet been announced. To hear more about the LaCrosse Avenir or the Enclave Avenir when they arrive, give us a call today at Rivard Buick GMC. 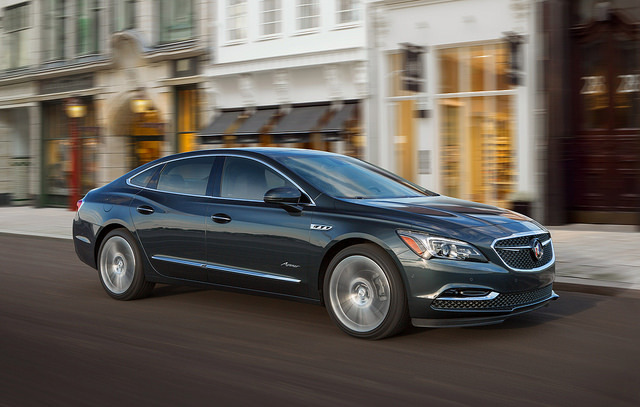 This entry was posted in Buick LaCrosse, Buick News and tagged 2018 Buick LaCrosse Avenir, Buick, Buick LaCrosse, Florida, Rivard Buick GMC, Tampa, Tampa FL. Bookmark the permalink.